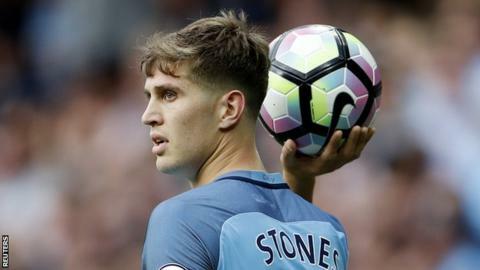 Premier League clubs have broken their transfer spending record with six days of the transfer window to go. Financial analysts Deloitte say top flight clubs' gross spending hit £880m on Thursday - beating the £870m set in last year's summer transfer window. At the same stage last year clubs had spent £685m. Dan Jones from Deloitte's sports business group said: "This is the fourth summer in a row where we have seen record-breaking spending." He added: "This is particularly striking considering we still have the best part of a week to go before deadline day. "With the third round of games in the new Premier League season to come this weekend and a number of clubs keen to strengthen with a view to competing in European and domestic cup competitions, total spending in this window will likely break the £1bn barrier for the first time." Premier League clubs are benefitting from a new £5.1bn television deal coming into force, meaning they have more spending power. Earlier this month Manchester United set a new British transfer record when they spent £89m on Juventus midfielder Paul Pogba. But some managers have complained that British clubs are being asked to pay too much for players on the back of the TV deal. Chelsea boss Antonio Conte last week said the market was "crazy", and that he was being asked to "pay £50m for medium players". The transfer window in England closes at 23:00 BST on 31 August.